DESCRIPTION: Awesome property for a corporate retreat or develop the property with view & river lots. 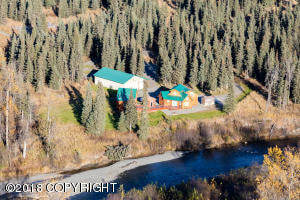 155 acres with Deep Creek frontage. Property has a 946 Sq. Ft. 1B 1B main cabin and a 535 Sq. Ft. 1B 1B guest cabin. T here is a 1,500 Sq. Ft. detached garage on the property. Many possibilities with this one of a kind property!! DRIVING DIRECTIONS: Sterling Highway south to aprox MP 136. Turn onto Oil Well Road, go to MP 2 and turn on Holly Street, to Lingonberry Avenue, follow around to Wildflower Street, to Gilbert. Property is on Gilbert.